BARCELONA, SPAIN--(Marketwired - Oct 11, 2013) - For groups looking to avoid the ho-hum experience of a traditional conference, the Renaissance Barcelona Hotel offers a tempting solution. Not only is the property comfortably ensconced in one of the most sought-after convention cities in the world, it also knows how to entertain well. Forget boring beige walls, stifling rooms and more artificial light than a baseball field. At this hotel, meetings are all about being inspired. While many hotels flaunt sweeping spaces and sizable square footage, this hotel in Barcelona celebrates the details. Coffee breaks, for example, aren't held in humdrum hallways but a dedicated pre-function space decked out in colorful, contemporary art and modular seating. The Rooftop Bar, meanwhile, is a unique Barcelona meeting space reserved exclusively for private functions like a cocktail party where attendees can mingle before a conference gets underway. The hotel's seven meeting rooms feature attractive appointments, too. The Diamant Meeting Room, for example, can accommodate up to 140 people in a space graciously illuminated by natural light. Other spaces are warmed by natural wood or streamlined with contemporary furnishings. All rooms, however, come equipped with wireless Internet, an ASDL line and teleconference capabilities. Plus dedicated event planners can ensure every event goes off without a hitch. But to be one of the most appealing events venues in Barcelona, a hotel must offer more than pleasant conference spaces. It must offer amenities and location to prospective groups as well. And this property does just that. Two restaurants, for example, exhibit good taste in every way, from the stylish settings to the menus that feature local cuisine alongside global favorites. The hotel rooms provide a refreshing Barcelona experience, too, thanks to their neutral color palettes, luxury bedding and range of technological features. And of course the hotel boasts an enviable city-center location for easy access to all the sights. No wonder then that every year Barcelona is the city to host the EIBTM, the global Meetings & Incentive Exhibition. This year the conference will be held from November 19 to 21, 2013. Barcelona, after all, has a lot going for it. Beaches, almost 70 parks, museums and architectural marvels (think La Sagrada Familia and Casa Batlló) all combine for a destination that is as alluring as it is inspiring. Located near the best of Barcelona's shopping, cultural and culinary attractions (including Las Ramblas and La Sagrada Familia), the Renaissance Barcelona Hotel is the latest expression of the city's finely-tuned sense of joie de vivre. Guests will find refreshing, contemporary styling in the lobby and 211 renovated guestrooms, while the seven meeting rooms are as productive as they are attractive with wireless Internet and teleconference capabilities. When the workday is over, guests can sip and sunbathe at La Terrassa, the hotel's eighth-floor rooftop bar, for example, or tuck into Catalan cuisine at CUIT Bar & Lounge, known for its fantastic classic and signature cocktails. (The hotel's CRU Steakhouse is another great option, offering a buffet breakfast and private lunches and dinners for those who crave a steak and a glass of red wine.) A 24-hour fitness center works around guests' varying schedules, while in-room amenities like luxury bedding, complimentary Wi-Fi, plasma televisions and iPod docking stations make modern travelers feel right at home. Renaissance Hotels represents a diverse collection of more than 155 hotels in 35 countries worldwide. Each property is unique, offering passionate travelers a one-of-kind experience and memories they will be sure to take with them long after they depart. Within every hotel, guests are greeted by an exceptional array of amenities and an inspiring world of local discoveries. For travelers looking to experience something new, innovative and locally driven programs including the industry leading entertainment platform RLife LIVE as well as R Navigator, ensure that every trip is transformed into an eye-opening, unforgettable journey. Renaissance Hotels. Live Life To Discover. To discover more visit www.renhotels.com. Forget boring beige walls, stifling rooms and more artificial light than a baseball field. 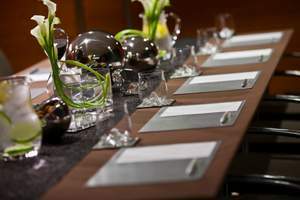 At the Renaissance Barcelona Hotel, meetings are all about being inspired.